Something incredible happened, would you believe our beloved Mrs. Rice actually sings pop music Karaoke? At Miao XioPing's multi-million dollars lakeside home (Bill Gates' neighbor), in front of the most luxurious Home-Theater/Karaoke machine I've ever seen, Mrs. Rice held a microphone and started the Rock & Roll evening by singing "Don't Get Around Much Any More" with her deep and beautiful alto voice! Not to be intimidated, I immediately followed up with my own rendition of "Mona Lisa", then MiaoXiaoPing and her husband Eric Cheng, and Yang XiaoPing contributed their favorite songs. It was the first time ever for Mrs. Rice and Yang XiaoPing to try Karaoke singing, but we just kept on singing with fun and 'no pressure' (ain't nobody's worrying about the correct singing technique that Mrs. Rice injected into us). Mrs. Rice also sang "Blowin' In The Wind", "Scarborough Fair" and other songs that this old man can't remember the titles of, because it was well past midnight when we departed the Chengs' residence. 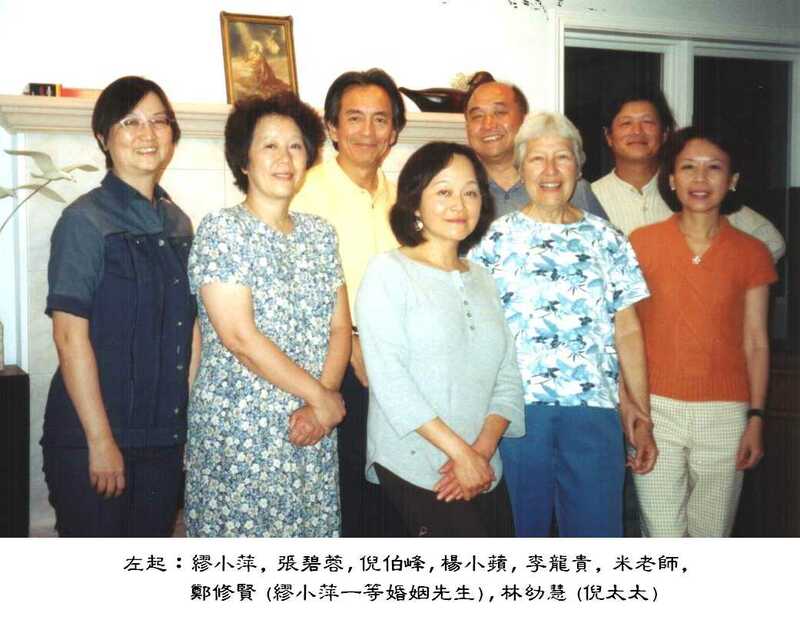 That was what happened on September 1, when Mrs. Rice and her friend traveled to Seattle, after a welcoming diner at a Chinese restaurant with Mrs. Rice and her friend Mary Ellen, Yang XiaoPing, Miao XiaoPing (with her husband Eric) and me (with my wife Youhuei). Li LongGui (Larry) and Zhang BiRong (Grace) were supposed be there too but some how they were not able to make it that evening. In fact we enjoyed the occasion so much that a formal proposal was made, "Since we need to prepare for the up coming Choir reunion at Taichung in late 2003 (early 2004?) why don't we have a choir rehearsal in Seattle before that?" What do you think about the possibility of doing that, doctor Sun? Those of us in Seattle are very fortunate to have met Mrs. Rice again so soon after the 30th reunion, wish you all could have the opportunity to get together from time to time in the future. Here is a picture to document the good time!